Walking casts come as both a shoe-like sole that is attached to a standard plaster or fiberglass cast, or as a brace that can be pumped full of air, which is also referred to as an air cast. Walking casts allow your broken bone -- generally below the knee -- to sustain some weight, allowing you a degree of mobility that standard casts do not. According to the American Academy of Orthopaedic Surgeons, walking casts and air casts are generally used for minor broken bones and fractures, or as a final healing stage for major or compound broken bones of the lower extremities. Consult your doctor to see what type of cast is appropriate for your injury. Walking casts are not suitable for treating some broken bones, as weight must be kept completely off the injury to allow it to heal properly. Get fitted for your walking or air cast, if your doctor determines that it is safe for you to do so. 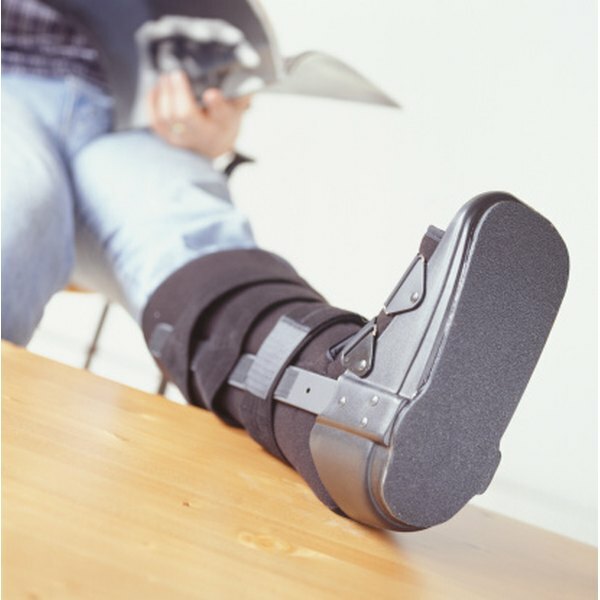 Certain types of walking casts will need to be molded to your foot, like a standard plaster cast. Air casts can be placed on your foot then adjusted with Velcro straps so that they fit securely. Allow your doctor to help you put the air cast on and adjust it so that it's appropriately tight. Allow your molded cast to dry, if you have a molded walking cast. Fiberglass molded casts take about an hour to dry fully, while plaster molded casts take anywhere from one to three days before they are dry enough to support weight. Attach the walking sole to the molded cast, if you have a molded walking cast. Place the bottom of the walking sole onto the cast, then pull the Velcro straps around your foot. Tighten and secure the straps so that the sole will stay on cast. Walk in a normal heel-to-toe pattern. Walking casts, whether molded or air casts, are designed to distribute weight evenly, so walking normally will not put added pressure on your injury. Follow your doctor's instructions about how often to use your walking cast, whether or not you should use crutches as an assistant and how often you should remove your air cast. Try to avoid standing on your cast for long periods of time. Keep your cast clean and dry. Remove the air cast for bathing, or protect the molded cast from water with a plastic bag. Keep the cast on for the period of time indicated by your doctor. Consult your doctor if you experience pain, swelling or numbness in your toes.